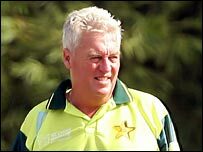 Surreal stuff, after the initial rumours that Bob Woolmer was murdered, the BBC are now reporting that he was strangled. The role of Pakistan cricket coach seems like a poisoned chalice, what with the numerous incidents of cheating, drug test failures, betting scandals, and match fixing that have blighted the Pakistan cricket team over the last decade. But, despite all this Woolmer seemed a cheerful man, even with Pakistan's inexplicable loss to cricketing minnows Ireland and the subsequent World Cup exit. We may never know the assailant or his motives as the Jamaican police appear rather inept - I've watched CSI, strangulation seems trivial to spot - and can only speculate on who and why. But perhaps the saddest thing for me is that cricket has lost a good man. I'm not going to be online much this weekend, so "patience Grasshopper". If you're also thinking of blogging about your invites, please link to any other folks you see ofering them, it'll make invite hunting much easier. Update 2006-03-19: I've still got a few left, and a Google search for "Joost invites" throws up a few others offering invites, such as Martin Varsavsky, Tom Raftery, and Chris Green. So Ewan, Matt and Carlo (and thousands of others) have the joys of SXSW awaiting them, I can't think of a similar cross-discipline event in the UK, perhaps the Edinburgh Festival comes closest. But that misses out on the techie angle, perhaps that's a situation for Ewan to fix! One of the best parts of SXSW for me every year (as a bystander across the Atlantic) is the collection of mp3 tracks that showcase the music of the bands appearing at SXSW, Erik Smartt points you at the first tranche of tracks - 793 MP3 files. I wonder how many of these bands are going to appear on TPN Rock? I'm actually rather amused by this, FON offering free routers to people who live next to a Starbucks (or any other cafe or restaurant if you read the small print). Now, I did the rough maths a while ago to justify whether a restaurant, cafe or bar could profit from FON, and 2 to 3 paying customers a week would be plenty to cover costs. With a free router the figures get slightly more tempting, and dsl prices in Europe have been creeping down a little over the last year. I have no idea whether FON are making any money yet, my hunch is that they're burning VC money KLF-style right now, but if they can get to a tipping point of enough coverage, the user numbers will ramp up enough to make it worthwhile for everyone. Offering free routers is a small part of this, getting FON coverage in places where people expect to see Wi-Fi (Starbucks) is a bigger move, not unlike the Burger King's cunning restaurant placement technique in many ways. Personally, I still think that 3G/HSDPA etc are too well entrenched to be beaten by FON, but with current European mobile data-prices there's a significant niche that FON could own.